This race is a part of the BTC Race Series. The BTC Race Series is a specially-priced bundle that allows you to register for all four BTC-hosted races in one easy step and at significant savings. This special bundle pricing is only open until the first race in the series, Adam's Heart Runs. Until this deadline passes, you can register for the bundle from any of the four race web sites listed below. Signing up for the bundle automatically registers you for all four races. The registration price for the BTC Race Series is $95. 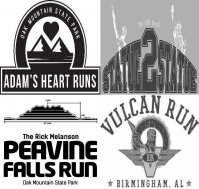 Birmingham Track Club members receive a discount of $5 per race for each of the four races, giving a total discount of $20 and lowering the BTC Race Series price to $75. If you are not a BTC member, take this opportunity to join and reap the savings! Here are the four races in the 2019 BTC Race Series. Click on a race name to go to the respective web site for more detailed information. Come run the roads of Oak Mountain State Park. Pick your race distance from 5k, 10k or 10-mile options. Starting in the shadow of Vulcan's statue and finishing near the Statue of Liberty, this race is known as "The South's Toughest 15k". You haven't run Birmingham until you run this race! This is our annual July 4th party in Oak Mountain State Park - that is if you consider running up and back down the mountain a party. This is another signature race that any Brimingham runner has to have on their running resume. This is one of the finest 10k races you will ever run. Starting and finishing in downtown Birmingham, this race draws elite runners from around the country.